Now the first numbers are balance sheet assets. Quite big numbers. The second row however have numbers that, to be honest, exceed my imagination. Those numbers consist of all kind of stuff, not only CDSs. Yet, the total market of CDSs might be in the USD 50 to 60 trillion range at this moment. Now tomorrow on Friday October 10th we will have the auction to settle the Lehman CDSs. The Big Picture: $400 Billion Lehman CDS Unwind? Hence, some recent fear can now be attributed in part to jumbo losses caused by Lehman's derivative unwind . . . with JPMorgan (JPM) being the biggest potential collateral damage . JPM has the biggest derivative exposure on the Street (I have no opinion on how this impacts them or on their derivative exposure). While Fannie and Freddie CDS settled at between 91.5 and 99.9 cents on the dollar., expectations are for Lehman to settle at 10 cent on the dollar -- causing a few $100 billion in losses. The only risk is that in the case of Lehman, there is much less netting i.e. the protection writers have huge one sides positions, and my estimates start blowing out. Not an expert, just trying to decipher the numbers with some commonsense reasoning. 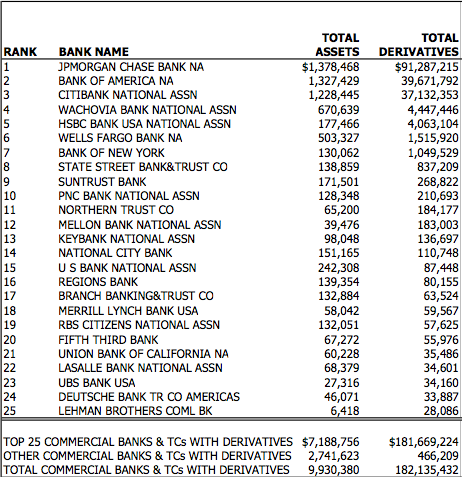 Looking at the table of derivatives exposure that Boom2Bust offered up a ways back in this thread, it strikes me as passin' strange that the CDS exposure for the top 3 banks (JPM, BoA, Citi) is so outsized in comparison to their other derivatives exposure. Almost as if they knew that a big chunk of the CDS they had purchased were vaporous, and had over-committed to compensate for it -- if so, imagine their surprise when so much (all?) of the swaps turned out to be toxic! -- it would have been interesting to also see the CDO exposure for each of these fellas, as I really doubt that they had purchased/sold over a hundred trillion dollars worth of CDOs between the three of them. It would be nice to see a competent panel of inquisitors (time to bring back the Spanish Inquisition?) grill the managements about this, and if it turned out that yes, they did over-commit because they were suspicious of the quality, then maybe we can find a better use for Gitmo than whatever we are currently using it for. Or perhaps I am clueless here (there seems to be a lot of that going around recently), and there is a perfectly reasonable explanation for such outsized allocations of CDS that would fall within the envelope of legitimate business practices. If so, would some tolerant and knowledgeable soul please 'splain it to me? Yes, can someone please explain to me wht economical sense there is in buying and selling derivatives over USD 90 trillion e.g. in the case of JP Morgan? If people said, yes, have known it all along, e.g. the UBS balance sheet was growing too big... then what please has been going on here?